← That Controversial Dave Dorman SAGA Blog? Yeah…That Was Actually Written By ME. Not Dave. The trending hashtag today on Twitter is #BeatTheHeatIn4Words. It is wrong that I instantly thought of Dairy Queen? 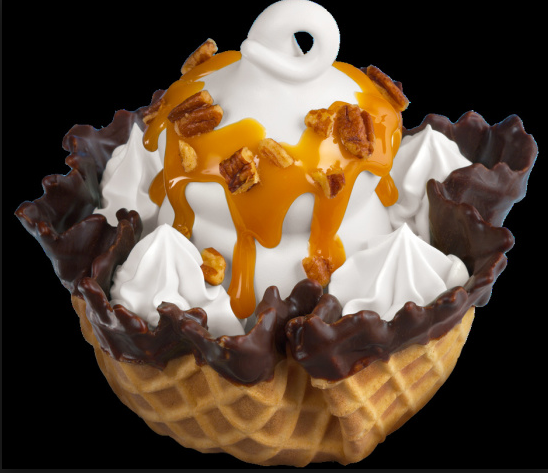 My 4-word suggestion: Dairy Queen Turtle Sundae. This is part of DQ’s “hidden menu.” I think it used to be on their regular menu, but ever since this confusing Dairy Queen-Orange Julius merger, things have gotten a little weird. But whenever I think of caramel, whipped cream and hot fudge, I instantly think of the Sister Wives. You see, the Sister Wives and I made a commitment to each other long ago. Our lifetime of depriving ourselves of hot fudge and caramel sundaes in the name of chasing junior-sized clothing will officially end once any one of us is on our deathbed. When we’re ready to take that final dirt nap, we’ve all committed to each other that at least three of us will be administering hot fudge, caramel and whipped cream in one final, delicious cornucopia of calories, gently poured down the throat of the dying Sister Wife in a flavorful fare-thee-well. It’s only fitting (since our clothes are fitting, due to extreme dessert deprivation). The only discrepancy will be Sister Wife Heather, who confounds me. You see, she doesn’t like whipping cream. (I’m saddened, just thinking of all the fun she must have missed in college…). There used to be a really great series on Showtime called “HUFF,” starring Hank Azaria, Blythe Danner and Oliver Platt. Blythe played this salty, sassy, aging mother. One of her card-playing friends was on her death bed after a major stroke, so Blythe gathered up her remaining friends, went to the hospital and administered the final solution out of mercy for her friend. That touching scene, and that act of friendship, has haunted me since I first saw it. This was well before I ever knew the Sister Wives. Call us morbid, but we discuss and refine this final chapter of our lives ad nauseam. We plot our final move to Oregon with the same level of care and detail that some folks put into planning their family vacations. The last time we were together, Heather sought my reassurance that I’d be okay with generic whipping cream. She was concerned that if mine was a sudden, imminent death, she might only have time to do rushed shopping in a gas station or 7-11 on her race to the hospital. I acquiesced. I might be so drugged up as to not be able to taste the difference at that point. I also agreed to Cool Whip, if things got really desperate. Hopefully, she remembers to pack a large spoon. The Sister Wives’ annual “glamping” trip is coming up shortly. (Glamping involves air conditioned, fully furnished housing with cable TV in a campground setting.) I’ve drawn up the legal documents, and I’ve already identified the notary in Baraboo, Wisconsin. When it comes to these kinds of commitments, we Sister Wives are. dead. serious. Posted on June 13, 2017 by DaveandDeniseDorman	• This entry was posted in Comic Book Wife, Fantasy, Friendship, Life Observations, Mommy Blogger and tagged BeatTheHeatIn4Words, Blythe Danner, Cool Whip, Dairy Queen, Death, Deathbed, Dying, Friendship, Hank Azaria, Hashtag, hidden menu, Huff, Notary, Oliver Platt, Orange Julius, Rituals, Showtime, Sister Wives, trending, Turtle Sundae, Twitter, Whipping Cream. Bookmark the permalink.